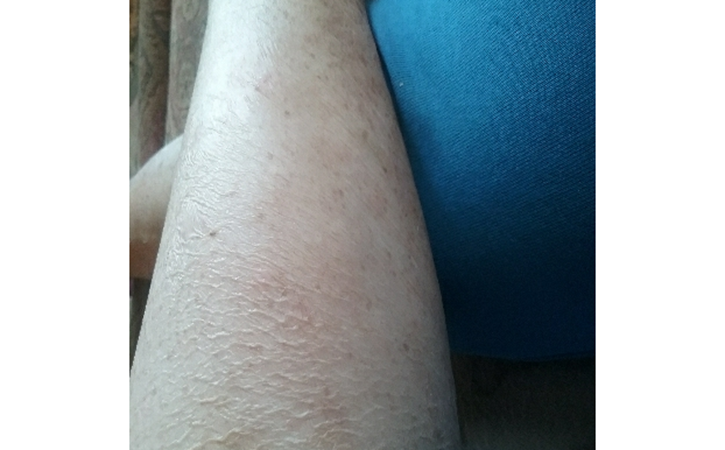 Asteatotic eczema is also known as winter itch, asteatotic eczema, xerotic eczema or Eczema craquelée. It’s a medical condition which causes pruritic, dry (crazypaving pattern), cracked, and fissured skin. One term used to describe what asteatotic eczema looks like is crazy paving. As the skin is cracked much like an old patch of concrete pavement. Asteatotic eczema in neurologic disorders. The condition is common in the elderly. The average age of presentation is 69 years, although it is not unknown in young people. Men are more affected than women. The incidence is highest in the winter and in cold climates. The typical symptoms like: splitting or cracking of the skin, superficial bleeding fissures on skin, dryness, itchiness, redness, and flakey patches. Younger age groups and even children can, however, be affected. The classical distribution is on the legs, although hands, arms and trunk can also be affected. The appearance is of slightly scaly fissured skin, which has been described as crazy paving or cracked porcelain. 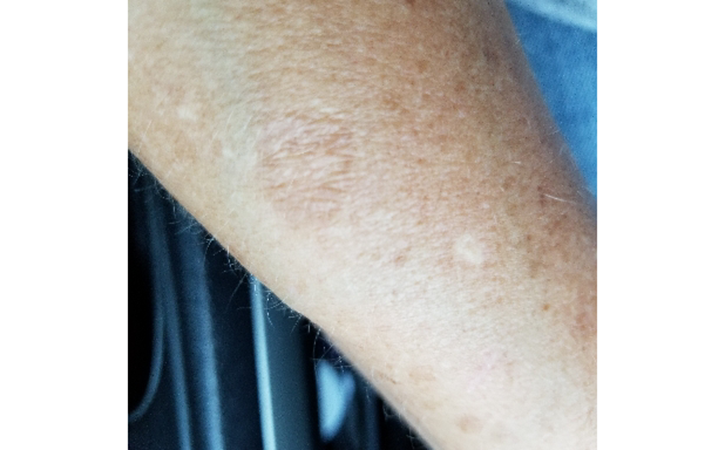 Areas of excoriation, erythema and bleeding, due to rubbing or scratching, may be evident. Most patients have a localized condition but a more severe generalized form is sometimes seen. Although the exact cause is not known, many experts believe that asteatotic eczema develops due to water loss. This water loss comes from the stratum corneum. What happens is there is a breakdown of the skin barrier, which many due to a genetic predisposition. This breakdown of the skin barrier, coupled with low humidity, causes the skin to lose its ability to retain water. Using excessive soap while bathing can exacerbate the problem, as soap can dry out the skin even further. Low-humidity environments (eg, central heating). Frequent prolonged bathing in hot water. Contact with irritants (eg, soaps, detergents, wool). Malnutrition (zinc and fatty acids). Luckily, asteatotic eczema responds quickly to treatment and rarely needs advanced treatment. There are four options that can help to treatment of asteatotic eczema. Moisturizers: Using a moisturizing soap when bathing. It can be helpful in treating asteatotic eczema because soap dries out the skin. Additionally, using a moisturizer which contains an emollient, that will help seal and lock in that moisture. Then the air does dry out skin. Topical ointments: – Ointments help create an additional layer of moisture which can help to improve the overall condition of the skin. Emuaid is a great option for someone who is in need of a great topical ointment. The ingredients in Emuaid have a proven track record of helping to soothe itching, irritating skin while improving blood flow, allowing the skin to heal faster and more effectively. A humidifier: – In case of dry climate, the air will naturally dry out the skin. It’s hard to fight against the air but using a humidifier is a step in the right direction. A humidifier will add more moisture to the air so the air will take less moisture from skin. Skin dryness: – In order to prevent future problems with asteatotic eczema, have to be vigilant when moisturizing skin. The better are with general skin care, the less likely will break out in asteatotic eczema again. Along with these treatment options, make sure to practice best practices for skin care. For example, take short baths as prolonged exposure to soap and water can damage the skin. Avoid harsh soaps and opt for one which contains moisturizing oils and lotions as previously stated. Lastly, try and avoid harsh cleaners. Caustic chemical cleaners are strong enough to clean, oil, grease, and dirt, which means that they are definitely strong enough to damage body’s natural skin oils as well as any lotions recently applied to skin. To confirm analyze, visit a doctor. Also visit a doctor, if is so uncomfortable that the condition is affecting sleep and daily activities, has a skin infection: look for red streaks, pus, yellow scabs, continues to experience symptoms despite trying home remedies.